A painting by renowned equestrian artist Jacqueline Stanhope called Brothers In Arms is to be sold for Charity on Monday 30th November at the Tattersalls December Sale. 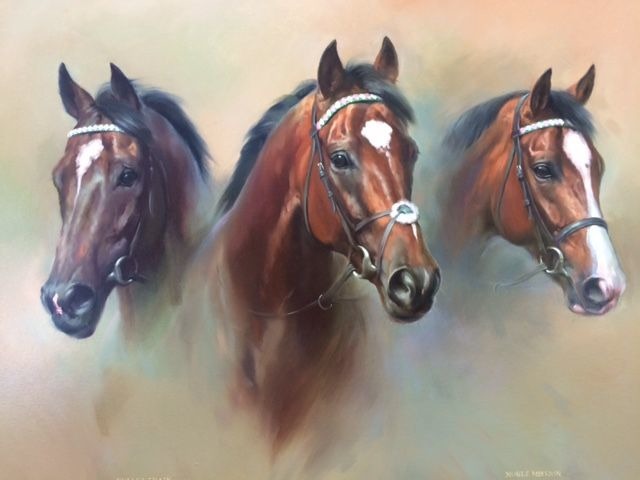 The painting, depicting the incomparable FRANKEL alongside his brothers NOBLE MISSION and BULLET TRAIN, both now standing at stud in America, is to be sold in aid of the Friends of the Newmarket Day Centre. The charity, whose President is Julie Cecil, has been established in Newmarket for 34 years and specialises in care for the elderly in Newmarket and the surrounding area. The painting will be offered immediately prior to lot 1603, NEW ORCHID, the first of the Juddmonte draft of broodmares selling on Monday 30th November, and can be viewed in the Juddmonte Tent at Park Paddocks prior to the sale. For further information please contact Nigel Wright, Tel: 07802 699145. Info & image with thanks and courtesy of Tattersalls.